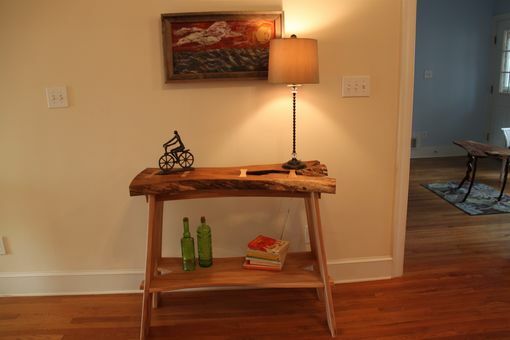 This entry table is built entirely of hardwood with no mechanical fasteners or glue. 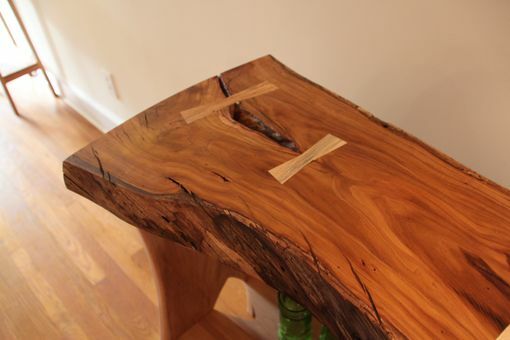 The top is a natural slab of beautiful redbud decorates (the state flower of Oklahoma even though it is a small tree) with four large butterfly keys made of white oak, matching the thickness of the top. 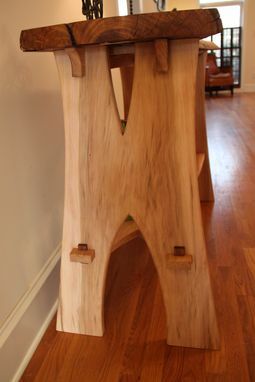 The legs, lower shelf, and stretchers which support the top are sycamore. I finished the piece by finely scraping the surface to maximize the depth of grain and then use an oil based varnish blend that begs to be touched. All the edges of this piece are finished with hand tools to give a lovely feel and texture. 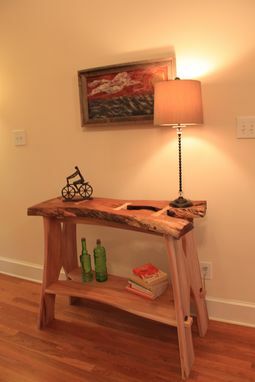 The top of this table was salvaged from a diseased redbud tree in my front yard in about 2004 and has been air drying in my shop since that time until the piece was finished in late January of 2015. inspiration for the shape of the legs and the natural style were taken from the top. 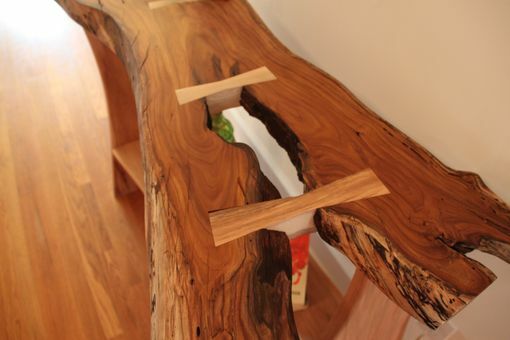 The design of the table does not require glue or permanent metal fasteners to hold it together. 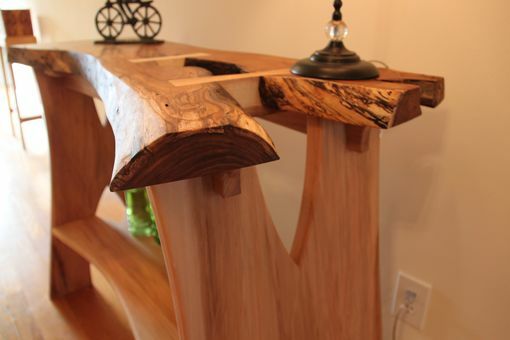 I chose to use traditional techniques and joinery to build the entire structure of the table. The only exception are the wooden clips and torx screws that hold the top to the stretchers in four locations on the inside face of the rails. The upper stretchers are curved using steam bending techniques to match the front and rear contours of the top slab and allow an even reveal when viewed from a standing perspective or postion. The saddle joints that connect the stretchers to the legs are splayed and slightly curved. 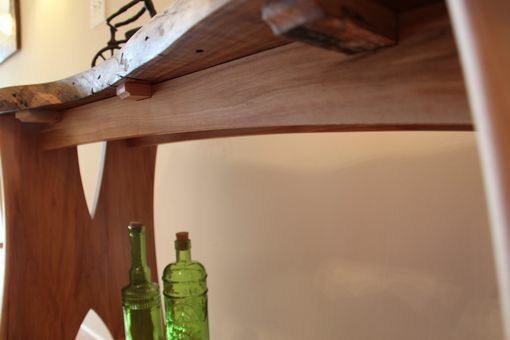 The 6 degree angle of the legs forces them outward due to the weight of the top and other forces from normal use which is countered by the through tenons and redbud wedges that connect the lower shelf and legs together in four locations. The joinery is all cut and fit individually by hand and is very tight. There is absolutely no racking and the piece is tight as a drum. Weight - Approx. 50-60 lbs. PLEASE NOTE that the shipping amount shown on this listing is an estimate only. If you decide to purchase an item for sale or commission a unique item for your home or business, the cost of packaging the item is included in the sale price (or is clearly identified on my estimates). In college I worked on a freight dock loading and unloading trucks and so I can state with confidence that Murphy's Law is most influential in the shipping industry. In other words I will carefully package and reinforce your purchase to ensure the shipping process does not add any unwanted character to your piece. The costs of shipping the item itself and any delivery at the Clients destination is not included in the sale due the variables of destination location, size, and weight. I would be happy to solicit quotes from shipping brokers to get you the most competitive pricing on any items that would require freight shipment.